Question everything. Think for yourself, and keep asking questions. Accept nothing purely on the basis of someone's appeal to tradition or authority. "Because that's how we've always done it" is not an acceptable explanation for continuing to engage in a behavior. "Because I said so" is not an acceptable answer to any question. These are efforts to stifle free inquiry. Do not accept them. When someone tells you that a particular subject - any subject - cannot be questioned, do not accept it. Push back. Ask why you are being discouraged from thinking. We learn by asking questions. We think in terms of questions. Let nothing be off limits to free inquiry. Nothing. Question religion, and question atheism too. Question your government, especially those you think are on "your side." Question yourself, as none of us are free from bias, irrationality, or weakness. Be suspicious of any worldview or ideology which seeks to inhibit free inquiry. It is likely to be dogmatic and to require your ignorance to sustain itself. Reject dogma. Attempts to dissuade you from asking questions should set off alarm bells. Something is wrong here! Question your most cherished political values. Question what you have been taught. People will challenge you in desperate efforts to "prove" that their sacred cows should never be questioned. Do not be fooled. When they say, "But surely you would not advocate questioning the value of racial equality," tell them that you support free inquiry and that nothing can be off limits to the mind. Question everything. When they protest, "But you would have to agree that there are no set of circumstances that could possibly justify torture," tell them that no questions can be excluded. Question everything. When they accuse you of moral relativism, cynicism, or even some form of solipsism, do not be deterred. 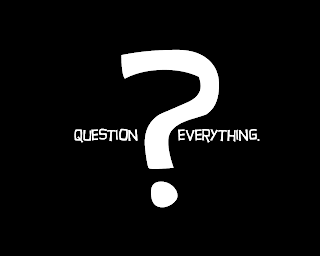 Free inquiry means that nothing is beyond questioning; it does not mean that there are no possible answers.